This holiday cottage for 2 people is located in the lovely village of Dwarsgracht, 3 kilometres west of Giethoorn. Here you can enjoy peace and quiet, the outdoors and recreation on the water at Weerribben-Wieden National Park. The owner has a boat available that you can rent. The house is a detached cottage on the owner's property, though you will have plenty of privacy as a guest here. This charming cottage contains one bedroom, making it ideal for 2 people. The cottage is furnished in a simple and cosy design, and the surrounding area will really make you feel you're on holiday. You can travel through the historic centre of Giethoorn, or explore other parts of Weerribben-Wieden National Park. You can enjoy the park's unique flora and fauna, lovely shoreline vegetation, vast reed lands and marshy forests. Anglers can try their hand at the local fish. And in the winter this is a great area for ice skating. Hikers and cyclists will also be in their element here, since the park has an array of different hiking trails and bike paths. The historic centre of Giethoorn is just a 10-minute bike ride from the holiday house. Called the Venice of the north, Giethoorn is known for its countless little bridges and canals. Being a popular tourist destination, Giethoorn offers many nice restaurants and cafes. 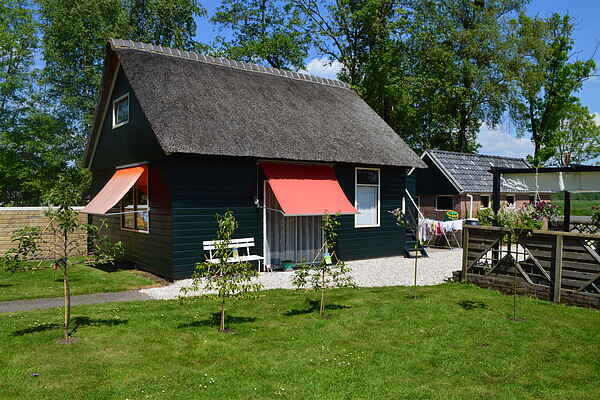 This holiday house has everything you need to explore Giethoorn and the surrounding waters. You can hire a boat on site from the owner for €25 per night. You get a discount if you rent the boat for longer than 2 nights (1 week = pay for 5 and get 2 free; midweek = pay for 3 and get 1 free; long weekend = pay for 2 and get 1 free). The boat can only be used from March 1st till November 1st.